My father notoriously used to ask my mother every time she was angry with him if she was about to start her period. It’s a classic stereotype, right? Women are hormonal, changeable, and unreliable. My parents later divorced and his dismissal of her emotions may well have rightly been one of the reasons. We women are blessed with a deep range of feelings, from kindness and empathy to grief and rage. I see our fluctuations in emotions and hormones as aspects of our power. And I see our power as something that we need to harness. These shifts help make women wise and complicated. I want my patients to understand their own cycles. If you can do this, then you can harness the power of each phase, and learn to use it to your advantage. It does not need to be a burden. 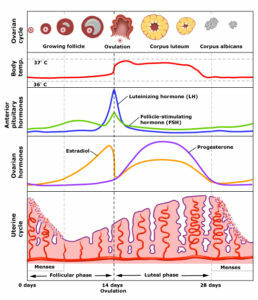 Your Menstrual Cycle. Except for those who have reached menopause (which we will talk about in a later installment) or have specific health conditions, we all menstruate. Even those of us with irregular cycles still have a period. Call it what you will — Aunt Flo, That Time of the Month, The Unmentionable, The Red Badge of Courage, The Red Tide, The Curse, The Rag — we all have periods. So isn’t it weird that many of us still feel a little shameful about it and don’t mention it in front of men? I will even admit that not much has changed for me since the first time I had my period. I had a movie-worthy moment at the grocery store when the cashier grabbed the mike and boomed “Price check on my aisle for maxipads!” I felt like everyone around me was staring and smirking. I was so mortified that I walked out of the store. Even now, as an adult I still feel like I need to hide tampons underneath the produce in the checkout line. Your cycle has two halves: before ovulation (pre-ovulatory) and after ovulation (post-ovulatory). The first day of your cycle is when you start your period and begin to bleed. While many of us have cycles around 28 days long, it is also common to have cycles shorter or longer than the standard 28. When you bleed, you are shedding the lining of your uterus . This happens EVERY MONTH unless you become pregnant, are nursing, using a birth control method that stops your period or you enter menopause. After about three days of bleeding your body begins to produce ESTROGEN, the hormone that is dominant for the first two weeks of your cycle. Estrogen causes the inner lining of your uterus to REgrow and thicken. A nice healthy uterine lining is a great place to grow a baby if pregnancy occurs. When estrogen reaches its peak, it stimulates your brain to produce LUTEINIZING HORMONE (LH), which spikes hard and high right in the middle of your cycle. The purpose of LH is to trigger the release of an egg from your ovaries. This is OVULATION. While the first half of your cycle is dominated by estrogen production, once ovulation occurs, the area in the ovary that released the egg, called the follicle, begins to secrete PROGESTERONE. During the second half of your cycle progesterone is produced in larger amounts than estrogen. Its purpose is to prepare that built-up lining (from estrogen during the first half of the cycle) to nourish an embryo, should the miracle of egg-meets-sperm happen. Progesterone prevents estrogen stimulation from creating a uterine lining that is too thick or unhealthy. It also stabilizes the lining that has been created. Of course, because nothing in life is simple, the balance between estrogen and progesterone is constantly shifting. They work together, and both are present in at least small amounts during your entire cycle, balancing each other to create a smooth transition from one menstrual phase to the next. If egg meets sperm, and there is an embryo that needs to live nestled in the uterine lining, hormone levels will remain high and even rise to support a healthy pregnancy. If there is no embryo present, hormone levels drop, sending the signal to your body to let go of the uterine lining that has built up. It is the drop in progesterone levels that triggers the release of this tissue. And it is the release of this tissue that is seen as your monthly bleed. 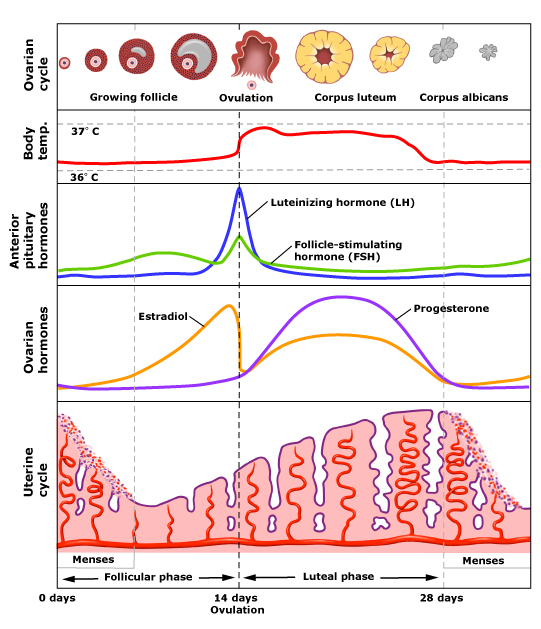 Hormone levels drop down to a baseline level, and your period begins. If the uterine lining were to continue to build due to estrogen stimulation without enough balancing progesterone, it would become too thick to maintain a healthy blood supply. For a woman trying to become pregnant, this overly-thickened uterine lining would not support a pregnancy. The less progesterone present to balance out estrogen, the thicker the uterine lining will become. In the absence of a pregnancy, women who experience extra buildup of uterine lining will eventually experience very heavy periods. Remember that the thicker the uterine lining, the more tissue is shed, which means a heavier bleed. Common conditions that result from not enough progesterone to stabilize a uterine lining include PCOS and endometriosis. There are many different types of menstrual conditions in which bleeding is excessive, too little, or does not occur at all. Many of my ensuing posts will describe these and other aspects of hormonal imbalances or symptoms caused by shifts in hormones. So how do we harness these shifts in hormones? How do we work with our cycles instead of feeling like they control us? I also LOVE LOVE LOVE the book “Taking Charge of Your Fertility.” It is the absolute best for helping you understand all of the intricate aspects of your cycle. Basically, you want a chart that has the number of days on one side of the graph and symptoms along the other. You can make this up as you go along according to how you feel during your cycle. You can chart anything you want: irritability, joy, pelvic pain, puffy face, cramps, etc. Are you someone who feels incredibly emotional the week prior to your period? Then know that this is a week when you should not plan any important meetings or major functions when feeling more emotional would perhaps be a disadvantage. Do you feel incredibly powerful during the week after your period? Then this is a week when you should schedule a half-marathon, important meetings, or activities that require stamina. I was picking up my RX and was telling the pharmacist how much I love my doctor. A customer stopped by and said she was looking for a good doctor in the area. Dr. Riley at thrive on front street is amazing. She cares genuinely for you and cares for your total self not just the symptom. I love her she is fantastic! - Linda P.